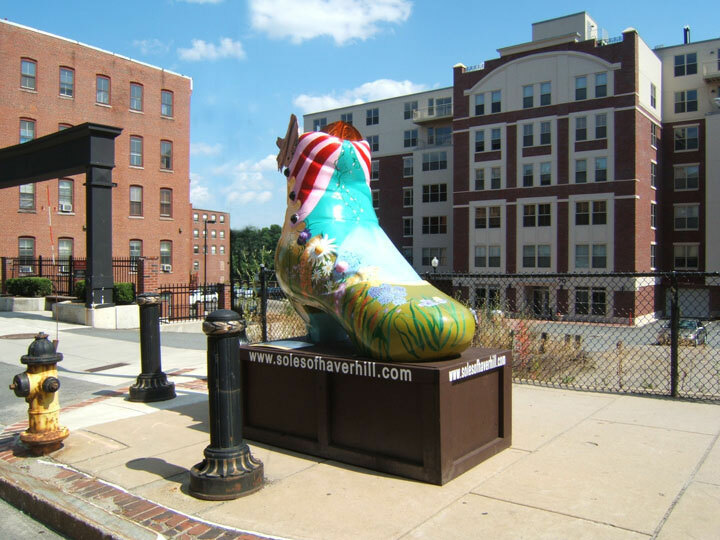 Soles of Haverhill is a community celebration of shoe manufacturing & design’s important role in Haverhill’s history, highlighted by the public display of painted shoe sculptures throughout downtown. 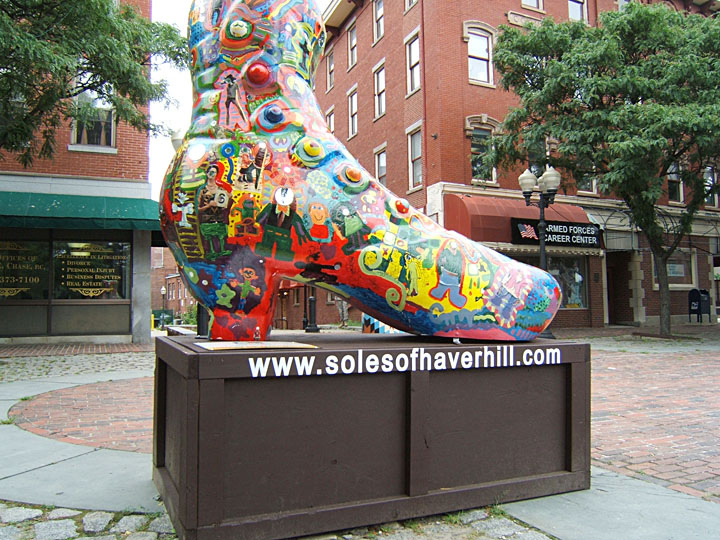 Seven “Soles of Haverhill” shoe sculptures—designed to function as whimsical benches—were installed at prominent sidewalk locations in September 2014, with an eighth-shoe to be installed at a later date upon completion of the crowd-funding initiative. Starting in mid-September, printed public art tour maps will be available at Positive Images Gallery (Wingate St.), Buttonwoods Museum, City Hall, and Haverhill Farmers Market. A Flourishing Future – Artist: Rob Sardella, sponsored by Pentucket Bank. Temporary Location: Pentucket Bank Stadium Branch. Final Location (2016): Harbor Place. 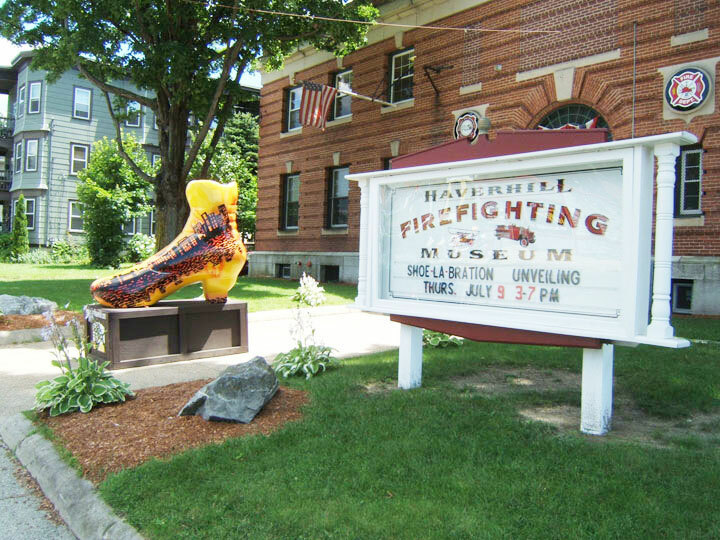 Seymour the Lion (See more with the Lions) – Artist: Dawn Evans Scaltreto, sponsored by Haverhill Lions Club. Dedication: In memory of Kenny Parker, a noble Lion, gone much too soon. Location: South Main Street at Greenleaf St. 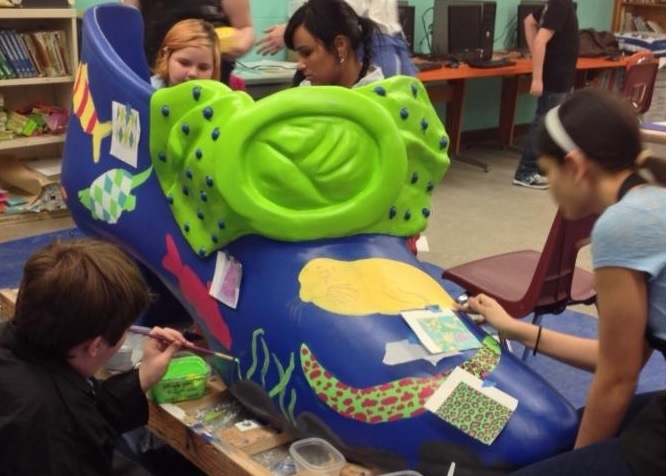 The Sole of Education – Artists: Marc Mannheimer, Jaclyn Marr, and Adam Dorgan, sponsored by Northern Essex Community College. Location: NECC Haverhill Campus. Fishy Fashionistas – Artists: Elizabeth Persing, with Consentino School Students, sponsored by Haverhill Public Schools Discovery Club and the STARS Residency Program of MA Cultural Council. Temporary Location: Riverwalk; Final Location (2016): Bradford Rail Trail. 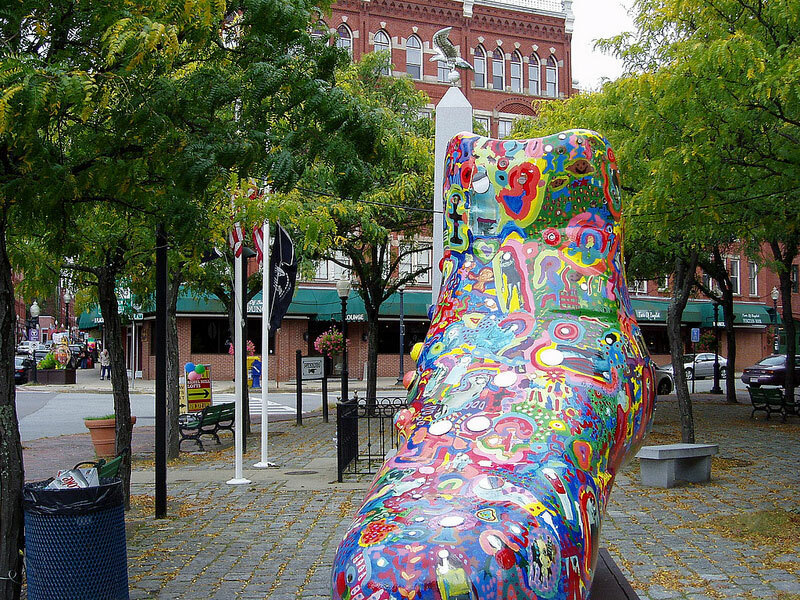 Morning Shoe – Artists: Michael Glowacki and Jill Barry, sponsored by Kevin B. Comeau Funeral Home. Location: Grounds of Cogswell School (pending School Committee approval). 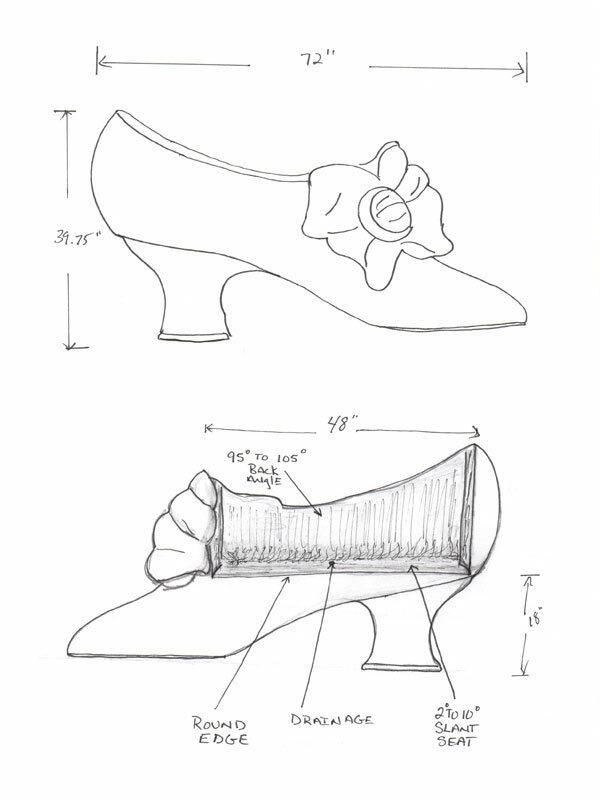 The shoe sculpture form for 2014 was inspired by a shoe in the Buttonwoods Museum collection. The “inspirational” shoe was made by the Hazen B. Goodrich Company for the World’s Columbian Exposition (Chicago World’s Fair) in 1893. 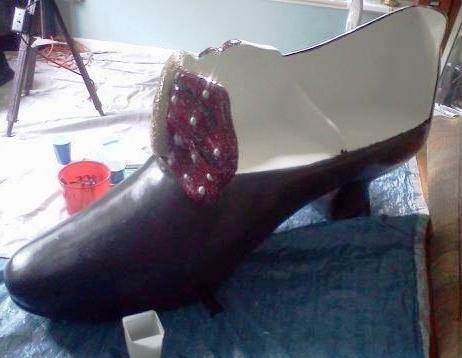 The upper part of the shoe is red silk and the sole is made of leather. The Louis–style heel is made of wood and wrapped in red silk. The shoe is embellished with a gold-tone metal buckle and gold-colored see beads stitched to the bow detail. The “bench” concept was chosen to allow for greater community interaction with the artwork, and to provide a practical solution to those wanting to rest and take in the downtown sites. 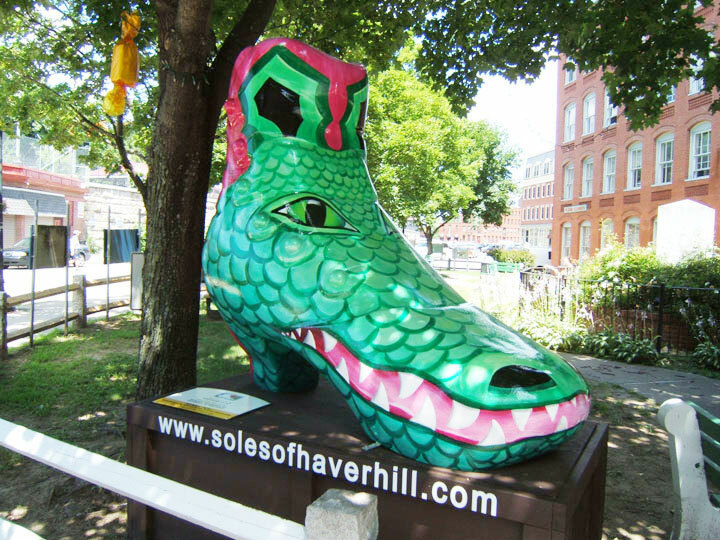 Team Haverhill has begun the initial planning for Soles of Haverhill 2014, and encourages community members to join our volunteer members in this effort. We will be actively seeking participation from artists, sponsors, community organizations, school groups, arts and cultural entities, service organizations and businesses. Please complete the Volunteer Form for additional information. 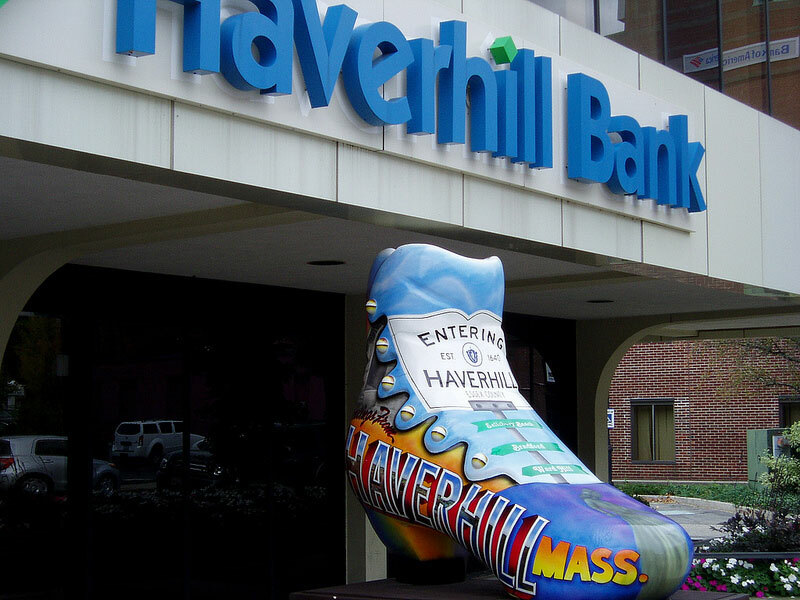 Though specific initiatives and events are still in the planning stage, Team Haverhill organizers hope to create a downtown “Fashion Trail.” incorporating the shoe sculptures and special events hosted by local and downtown businesses. 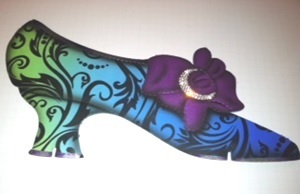 Please also visit our Facebook page and “Like us” at facebook.com/solesofhaverhillshoelabration. The initial call to artists has been issued and you can find it here. If you have questions about the call, please contact info@teamhaverhill.org. 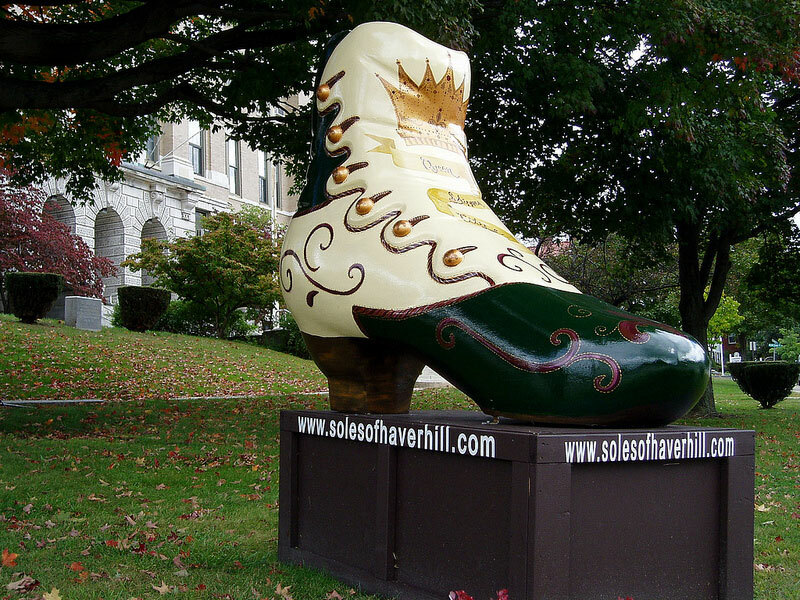 The inauguration of Soles of Haverhill in 2009 featured 14 wonderfully painted and designed shoe sculptures by local artists. 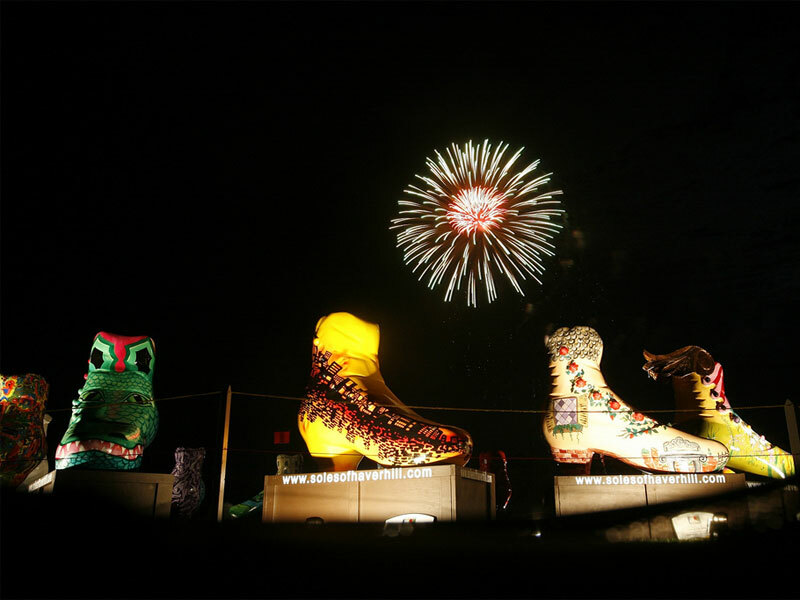 After presentation to the community at the 2009 July 4th fireworks display, the shoes were relocated around the community. Organizers produced and distributed posters and a sculpture trail map to promote community understanding of the themes, artists, and historical links. 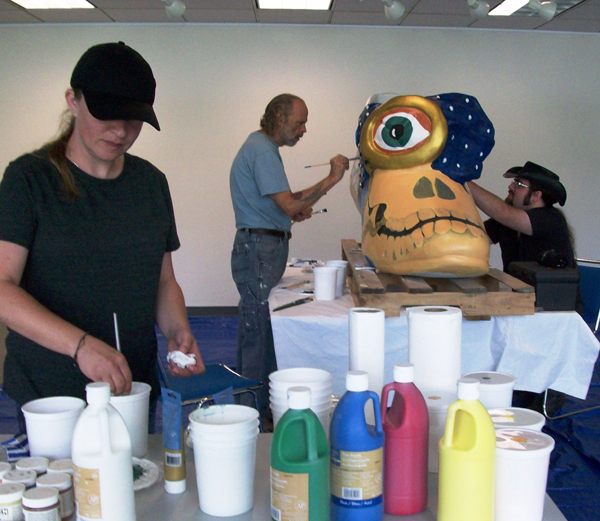 The sculptures were sold at auction in October 2009, raising more than $40,000 for local non-profits nominated by the shoe sculpture sponsors. 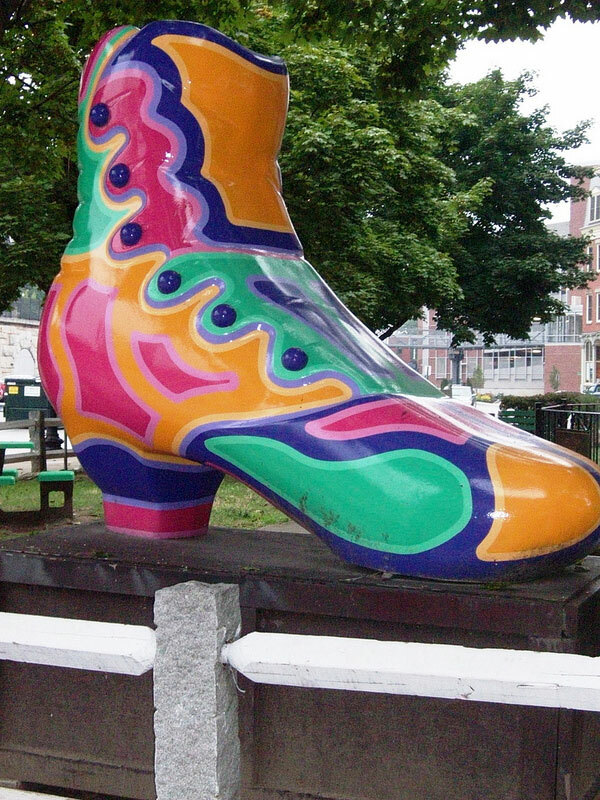 Many of the shoes remain in the community to be enjoyed by residents and visitors.